Götz Hoeppe, (2012) ‘Astronomers at the Observatory: Place, Visual Practice, Traces’ Anthropological Quarterly 85: 4 1141-1160. Focusing ethnographically on astronomers engaged in “look back studies” of cosmic evolution, this essay considers how they make telescopic observations at an optical observatory in the context of their epistemic work at other sites. Foucault’s notion of a heterotopia captures key aspects of how the observatory is set apart from astronomers’ work with digital data elsewhere. However, visual practices of interpreting telescopic exposures in the observatory’s control room do reach across this divide and inform later epistemic work, such as when scientists use these exposures retrospectively as windows into the functioning of telescopes and detectors. Visiting astronomers remark that witnessing the emergence of exposures in the control room asserts to them the reality of the cosmic objects they study. I interpret this as being grounded in their understanding of semiosis. James Denison has sent me a link to a video clip of a small part of an interview with Deleuze (with sub-titles). The animal perspective on territory is fascinating. In a very modest way, could heterotopia be seen as a ‘barbaric’ term as described by Deleuze in this interview clip, a somewhat playful invention to uncover new connections between spaces, evoking opportunities and dangers? ‘A for Animal”, the first part of the eight-hour series of interviews ”L’abécédaire de Gilles Deleuze”, filmed by Pierre-André Boutang in 1988-1989. Angie Knaggs highlights how heterotopia has been used to examine a variety of media texts. ‘The term ‘heterotopia’ has been applied to various media texts, and while Foucault never mentions television in his discussion of heterotopic space, it nevertheless provides a useful concept to approach television as a site of contradiction. Billingham (2000) examines the fictionalised ‘gay village’ in the British drama series Queer as Folk as an example of Foucault’s concept of the heterotopia. Bury (2005) applies the concept to female fan forums. Elliot and Purdy (2006) have applied the term to the cinematic work of Peter Greenaway, and Dove-Viebahn (2007) applies the term to Star Trek. What these applications have in common is a persistent association with spaces of resistance’. Barrera, E. (2003) ‘Aliens in heterotopia: an intertextual reading of the Border Control Museum’ in Ethnography at the Border. Edited by Pablo Vila. Minneapolis: University of Minnesota Press, 166-181. Billingham, P. (2000) Sensing the City through Television: Urban Identification within Fictional Drama. Oxford; Portland. Bury, R. (2005) Cyberspaces of their Own: Female Fandoms Online. New York: Peter Lang. Elliott, B. and Purdy. A. (2006) ‘A Walk Through Heterotopia: Peter Greenaway’s Landscapes by Numbers’ in Landscape and Film. Edited by Martin Lefebvre. New York: Routledge. Interstitial: A Journal of Modern Culture and Events : ‘a peer-reviewed, open access, and post-disciplinary journal dedicated to exploring the myriad expressions, impacts, and genealogies of modernity’. ‘In the modern era, interstitiality, or the space between one boundary and the next, has become an urgent area of investigation. Existing within and between entities, interstices challenge conventional understandings of boundedness, inviting us to rethink the space between objects and ideas as an erupting site of transformation’. An anecdote: with some amusement, Defert, Foucault’s long-term partner, describes how at the end of Foucault’s lecture on heterotopia, the architect, Robert Auzelle, offered Foucault his history of funerary architecture (Defert, 1997: 276). Auzelle, who appreciated Foucault’s lecture, was an advocate of the cemetery park as an integral part of town planning (Rogan, 1983: 259). He saw the cemetery as an important ‘green space’ and at one time also proposed the creation of a single cemetery for the whole of France, built in an under populated department of the country which would be devoted entirely to the dead (301). 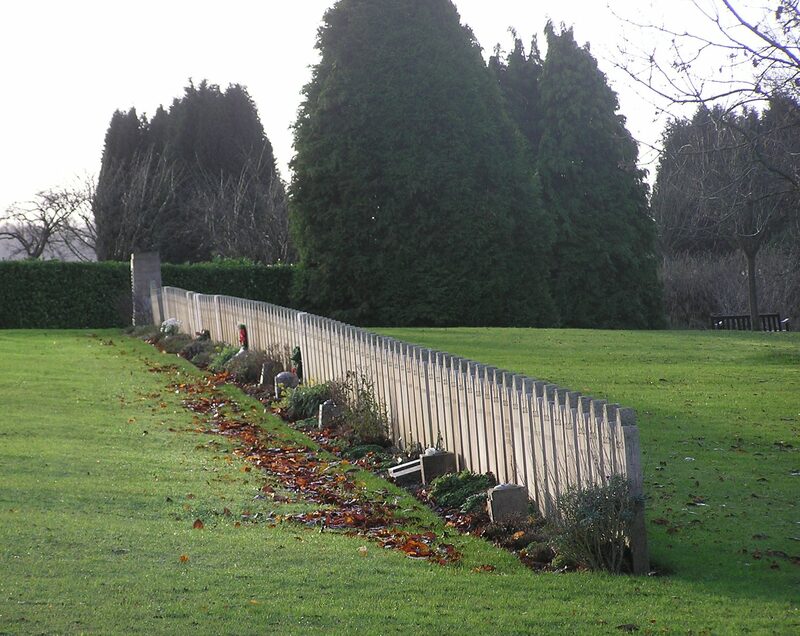 In summary, much of the recent debate about the future of cemeteries (in Britain at least) has surrounded practical concerns about the lack of burial space and the potential for incorporating new functions. But apart from this pragmatic debate, it should not be forgotten that cemeteries offer a certain imaginative intensity. Faubion contrasts heterotopias to the ‘mundane monotony…. of everyday life’ and suggests they are ‘brighter, darker or more complex’ (2008: 32). I do not think this is quite right. They have an ambivalent position that is often part of the mundane and yet they enclose something that is bright, dark and complex. Defert, D. (1997) ‘Foucault, Space, and the Architects’ in Politics/Poetics: Documenta X – The Book, Ostfildern-Ruit: Cantz Verlag, 274-283. Faubion, J. (2008) ‘Heterotopia: an ecology’ in M. Dehaene and L. De Cauter (eds. ), Heterotopia and the City, London and New York: Routledge, 31-40. Francis, D. et al (2005) The Secret Cemetery, Oxford: Berg. They underline the point that ‘while such objects stimulate memories that remain motionless, they simultaneously evoke the passage of time’. Cemeteries are full of graves that possess simultaneously a presence and absence, or as they say, rather mauling TS Eliot, ‘past presence and present absence are condensed into the spatially located object’ (85). In this sense, a cemetery is a space for emplacing the placeless. Tracing various etymologies throws some light on this fundamental ambiguity. Harrison notes that the Greek word for ‘sign’, sema, is also the word for grave. The grave pointed to itself, a sense of ‘here’ that is only manifest in the sign itself: ‘prior to gaining outward reference, its ‘here’ refers to the place of its disappearance. It is the disappearance of death that ‘opens the horizon of reference in the first place’ (2003: 20). In contrast, Worpole makes the point that in German the word for monument, Denkmal, means ‘think-mark’ or object that makes you think. (203: 195). It provokes a notion of absence. Hallam and Hockey also refer to Foucault’s concept of heterotopia directly. In their interpretation, heterotopias are spaces that are assigned a multiplicity of meaning. For them ‘death has the power to create a heterotopia, that is, the layering of meanings at a single material site’ (2001: 84). Hallam, E. and Hockey, J. (2001) Death, Memory and Material Culture, Oxford and New York: Berg. Worpole, K. (2003) Last Landscapes: The Architecture of the Cemetery in the West, London: Reaktion Books. Contemporary cemeteries have adopted various useful applications (e.g. environmental habitats, educational centres etc. ), but they also remain highly complex and ambiguous spatio-temporal enclosures. Worpole, in his study of cemetery landscapes, wonders whether we have the ‘vocabulary for describing what these unsettling landscapes mean culturally’. Are they religious or secular, places of despair or places of hope and reconciliation? Does the reminder of mortality help to moderate the fear of death or highlight it? (Worpole, 2003: 56). The study presents the cemetery as being both exceptional and separated from everyday regularities and at the same time a domestic, or at least ordinary, space. The study concludes that the cemetery is fundamentally incongruous: ‘they face the visitor with contradictory meanings and existential ambiguities that alternate between clarification and obfuscation through ritual action’ (214-215). The researchers argue that the cemetery is a totally different space and highlight what I believe is a key feature of heterotopia. The domestication within contemporary English cemeteries represents or reconfigures what is outside, but simultaneously the space remains utterly disruptive. Why? In part, perhaps, because we cannot know death directly, so we set up metaphors to try and come to terms with it in some way, to make death thinkable. But the potential therapeutic value is never settled. The grave is an inherently incongruous spatio-temporal unit. In some ways, modes of domestication underline as much as mask this incongruity. Francis, D. Kellaher, L. and Neophytou, G. (2005) The Secret Cemetery, Oxford: Berg. Many have debated which is the heterotopia par excellence. Foucault suggested the ship. I tend to favour the cemetery and will devote a few posts to this space over the next week or so. But today I came across (via the BBC radio) Morbid Anatomy a website that ‘surveys the interstices of art and medicine, death and culture’. The site and blog is linked to The Morbid Anatomy Library and Cabinet in Brooklyn, New York: ‘a research library and private collection available to the interested public. The library/cabinet makes available a collection of books and catalogs, photographs, fine art, taxidermy, ephemera, and artifacts relating to medical museums, anatomical art, collectors and collecting, cabinets of curiosity, the history of medicine, death and society, natural history, arcane media, and curiosity and curiosities broadly considered’. 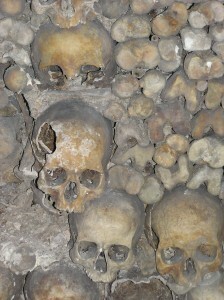 Catacombs under Paris - own photograph.